The tension within the party comes as Pelosi is racing to secure the support she will need to claim the House speaker’s gavel when Democrats take the majority next year, and amid broader tension between moderate members worried about overreaching and progressives who see bold proposals as the key to the party’s future. The new climate plan goes well beyond the Obama-era cap-and-trade climate policy that House Democrats embraced before losing their previous majority in 2010 — but since then, renewable energy’s costs have plummeted while its popularity has risen in key electoral states like Colorado. While she is confident she will prevail, Pelosi faces a thin margin for error and has launched an intense campaign to round up the support she will need, and Democrats are using that vulnerability to attempt to secure concessions on a host of issues. Climate activists are urging Ocasio-Cortez and other liberals to consider withholding their support for Pelosi’s bid to be speaker without additional concessions. 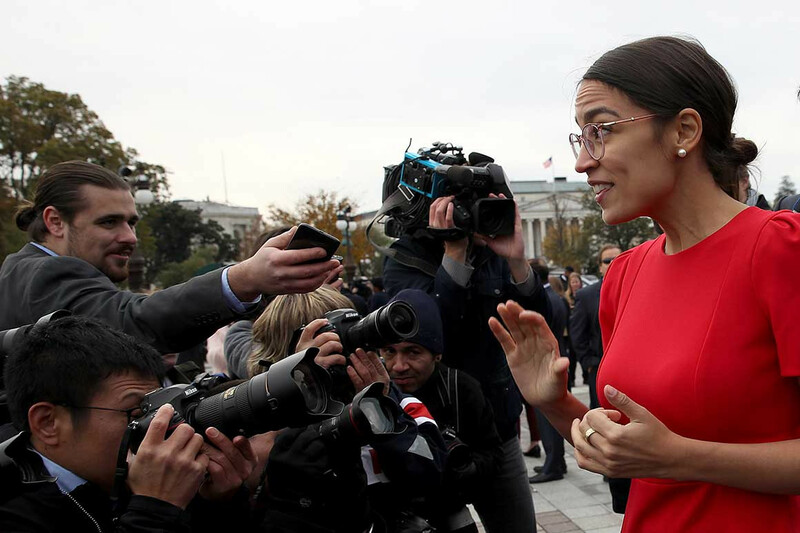 Ocasio-Cortez is gathering support for a resolution that would establish a select House committee to develop legislation on the Green New Deal, a set of ambitious principles that progressives envision as a work-in-progress Democratic Party platform on climate change. Rep. Ro Khanna (D-Calif.) and incoming members Deb Haaland (D-N.M.), Ilhan Omar (D-Minn.) and Rashida Tlaib (D-Mich.) have all endorsed the Green New Deal resolution. Other liberals, like Pramila Jayapal (D-Wash.), have not endorsed the Ocasio-Cortez resolution but backed similarly ambitious legislation like transitioning the U.S. to 100 percent clean energy by 2050. Most have remained coy on whether they’ll support Pelosi on the floor. The Green New Deal resolution calls for a bevy of far-reaching liberal goals to decarbonize the economy within a decade by reshaping the electric power, agriculture and transportation sector, but it includes few details outlining how to get there. That is likely too ambitious even for many Democrats — and would stand zero chance of getting past Senate Republicans or President Donald Trump — but the concept has become an important rallying cry for the need to address climate change. Pelosi created the Select Committee on Energy Independence and Global Warming when she was first elected speaker in 2007, but Republicans eliminated the committee when they took the majority in 2011. Now, a growing number of senior Democrats say they don’t know whether the panel needs to come back. The letter from Beyer and Lowenthal came a few hours after three Democratic chairmen-in-waiting — Energy and Commerce ranking member Frank Pallone (D-N.J.), Science ranking member Eddie Bernice Johnson (D-Texas) and Natural Resources ranking member Raúl Grijalva (D-Ariz.) — announced they would be holding climate change hearings early next year, in an apparent attempt to protect their turf. “Our committees plan to work closely together to aggressively assess the public health, economic and environmental impacts of climate change and to explore the best solutions to combat this challenge,” they said in a statement. Grijalva, a member of the Congressional Progressive Caucus who has said he plans to back Pelosi, said he understood why Ocasio-Cortez and others are pushing leadership to be more aggressive in attacking climate change. “I would agree with some of their criticism. We’re baby-stepping it,” he told reporters Wednesday. But climate change wasn’t a top issue most Democrats campaigned on in a wave election, and the incoming majority is expected instead to focus on health care, infrastructure and conducting oversight on the Trump administration. Republicans will likely paint any Democratic plan to address climate change as too expensive, but activists say Democrats should not fear such attacks from a party that has overseen growing deficits and did not pay for its massive tax cut last year. That’s not to say Republicans won’t make the argument anyway. “Green New Deal? Sounds like a lot of red ink,” Sen. Cory Gardner (R-Colo.) told POLITICO.